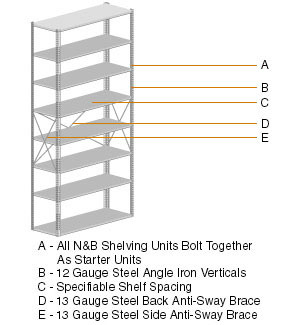 N&B Shelving is Adjustable's most economical shelving system, ideal for "back room" storage solutions where "bottom line" cost and function are the most important factors. 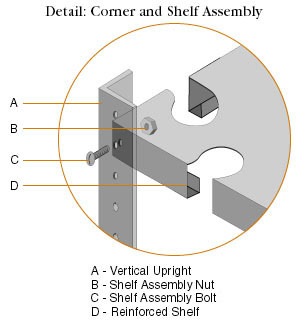 But don't confuse Adjustable's N&B shelving with cheap mail order shelving; N&B Shelving is built with the same robust standard as all other Adjustable shelving products, with edge-turned shelves and heavy vertical supports for exceptional strength and rigidity. 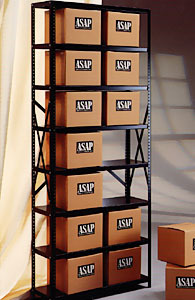 © 2004-2019 Karp Associates, Inc.